Rabbi Sid Schwarz is the project director and lead New York faculty member for the René Cassin Fellowship Program (RCFP). The RCFP provides young professionals with the knowledge, skills and contacts needed to enhance their activism in the areas of social justice, international human rights or related fields. The program will have hubs in New York, London and Jerusalem, with 12 fellows in each hub. Over the course of a year Fellows will gather for monthly study sessions that explore human rights through the lens of Jewish values and the Jewish historical experience. The program also involves intensive interaction between the three centers of Jewish life, a 9-day study tour to Israel and hands-on internships in institutions working on human rights and social justice issues. Take a look at the 2014 Israel study tour itinerary and read some letters from the 2014 Fellows: Alexis Ortix from the United States, Ben Jacobs from London and Anna Landau from Israel. Here is an overview of the Fellowship program goals and objectives. For more information or to apply for the 2015 Cohort, visit ReneCassin.org. René Cassin is a London-based non-profit organization, founded in 2000, that uses the historical Jewish experience and positive Jewish values to campaign and educate on universal human rights issues such as discrimination, detention and genocide. 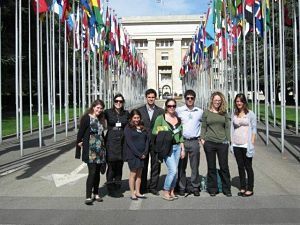 With special consultative status at the United Nations, René Cassin uses that forum to give voice to Jewish values within the international human rights community. The organization is named in honour of René Cassin, a French Jew and Nobel Laureate, who was one of the principal co-drafters of the Universal Declaration of Human Rights along with Eleanor Roosevelt. Click here to read an article about René Cassin.